MJX Bugs 3 Mini Review  Is there any better drone in this $$ range ? You’d expect the first rodeo to be disastrous and without anything good about it but MJX doesn’t agree with this. In fact, their first mini brushless quadcopter is not what you’d expect. You see, MJX doesn’t follow the rules; when they make something for the first time – it has to be awesome! Just take a look at their first ever entry-level aerial photography drone (MJX Bugs 3) which was an absolute bestseller… and, honestly speaking here, nothing less can be said about the Bugs 3 Mini. That’s exactly why we’re here today – MJX Bugs 3 Mini review ! Oh, by the way, it sounds like this drone is just an evolution (on a smaller scale) of the original Bugs 3 model but this isn’t true either. The Bugs 3 Mini doesn’t share almost anything with the original model as it is revamped in every way. The only thing they have in common is looks (which are, if we are to be realistic here, gorgeous af). Now, let’s see what the Bugs 3 Mini is all about and how can it help you learn the basics of flying drones in Acro Mode! MJX hasn’t always been a well-known and respected drone maker. They’ve emerged on the market some time back and have enjoyed success only recently in 2017 when they released the original Bugs 3, a marvel of engineering from a relatively unknown company. Since then, they’ve evolved and grew ballsy, releasing models such as the Bugs 2W and the 5W. The former is still a really hot topic in the drone industry, delivering unparalleled performance at just a fraction of the cost you’d pay for a premium model. This helped them become the absolute leaders of mid-tier models. They’ve tried their hands at creating budget-friendly aerial photography drones, and you’d expect the same with the Bugs 3 Mini, their newest mini quadcopter. But, MJX has been known to throw in some surprises… And that’s exactly what happened with the Bugs 3 Mini. The Bugs 3 Mini is a fully-fledged, miniature sports drone. It’s been designed to pander to beginners, but even more advanced users would be happy with it. The price tag is a tad aggressive (which we’re used to when it comes to drones from MJX) but considering what it offers – it’s understandable. There are drones that can fly up to 500 meters away from you and still not lose signal but there aren’t any drones with the price tag similar to the Bugs 3 Mini that can even go above 200. That’s why the Bugs 3 Mini has brought so many people to look at it; it has an impressive 300 meters operational range which, for a mini sports drone at this price, is just astounding. MJX has been known to push the envelope on what is usually considered possible so it’s not really understandable why the Bugs 3 Mini has a relatively short flight duration. 10 minutes is completely fine for some people but you got to take into account the fact we are talking about a really small model here. Plus, it’s really fast and you are getting an extra battery in the package! What’s there to say about a mini sports drone that is lightning quick, maneuverable, and lets you control it with so much ease. It’s agile as well so you’ll be able to do anything with it (as long as you don’t crash it!). It might not suit the more advanced user, but when it comes to beginners – you won’t find a better sports drone than the Bugs 3 Mini. Don’t expect to use this mode if you’re just starting out with flying drones. It isn’t reserved for experienced users, per se, but will cause you to crash your drone if you aren’t familiar with flying one. When you turn Acro Mode on, you get rid of all stabilization which allows you to do some pretty crazy stuff. Even though this is labeled as a sports drone, it does feel lackluster because of the lack of camera. Basically, you’ll be able to fly this little devil in LOS and that’s not exactly everyone’s cup of tea. But, there is a ray of light! Installing the AIO FPV system is easy as one, two, three so DIY is available! Taking inspiration from the original Bugs 3, MJX Bugs 3 Mini is well-made and beautiful. It features dual-bladed props that are also self-tightening, virtually the same Bugs 3 canopy that we all know and love (the same one is on the Bugs 3), and short landing pads. As with other MJX models, this one uses a proprietary battery as well. Once you plug it in, it’ll immediately start to whir meaning that there’s no on/off switch. The battery that this drone uses is a 2S 850mAh 45C LiPo battery. You get 7.4V from it which is more than enough for some crazy maneuvers and outstanding torque. Fortunately, it provides just enough airtime as you would expect from a full-sized model. 10+ minutes of flight time is actually pretty nice for such a small drone and even more so considering the price tag. You could go above 10 minutes if you’re not pushing it too hard. On the bright side though – you are getting an extra battery inside the package which means you will have access to roughly 20 minutes of flight time straight out of the box. 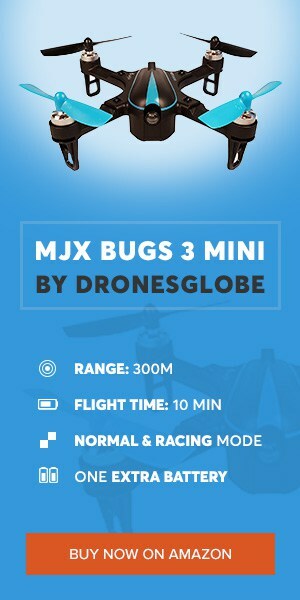 This is just one of the perks you’ll be getting if you buy the DronesGlobe edition of MJX Bugs 3 Mini, so keep that in mind if you opt to buy it. Who would have expected this little drone to have around 300 meters of operating range because I sure didn’t! It’s ridiculous; even some higher-end models that are meant to have a large operating range can’t reach the one that Bugs 3 Mini offers. We even placed in a 3rd party AIO FPV system onboard so we can get some range tests done the proper FPV way. Obviously, this thing is too small to be visible at 300+ meters so LoS (line of sight) flying is a no-no this time around. Reliability and power usually don’t go well together but MJX managed to create the perfect balance between these two characteristics with their Bugs 3 Mini. It uses 1306 2750Kv brushless motors – and pretty good ones for that matter. You’ll be able to use this thing for months on end without having any sort of failure. The downside when it comes to internals is that it has a 4in1 ESC that has a rating of only 4A. So, when it comes to modding and upgrades – you’re quite limited unless you are ready to switch out the ESC board as well. Well, it’s not exactly packed like some upper-end models, but it has everything a beginner would need from a mini sports drone. You get a low battery voltage alarm, out of range alarm, and two flying modes (acro and angle). Acro mode is reserved for experienced pilots only and shouldn’t be turned on by a beginner (unless you want to crash your drone for whatever reason). These two modes can be switched only when the drone is stationary so once you’ve mastered angle flying, try your hand in a simulator and then give Acro mode a shot in real life. Unless you want to control your drone in strictly Line of Sight manner, you’ll need to set up an FPV system. One great option would be to choose one of those cheap all in one systems which don’t just pack a video transmitter but a solid FPV camera too. Simply place it instead of the LED light that comes in the front of the Bugs 3 Mini. You won’t need to solder anything or make larger modifications because the LED flashlight functions through a dedicated JST-ph connector located in the front of the PCB. The connector is easily accessible and all it takes is a small amount of hot glue or double-sided tape to secure the camera and that’s it! Unfortunately, you won’t be able to install any more upgrades (or anything other than this FPV system) because the 4A AIO ESC board won’t be able to handle motors with more power such as the EMAX 4000Kv. However, this isn’t that big of a downside because performance-wise – MJX Bugs 3 Mini is great. There’s not a lot of negative things to say about this little bugger. If we take into account the fact it’s fast, agile and sports Acro mode (and you can easily mod it), we will come to a conclusion that MJX Bugs 3 Mini is everything you’ll ever need from a beginner sports drone. You’ll be able to race it in many ways, especially when you turn on the above-mentioned Acro mode – the whole experience becomes miles better once a camera is installed. All in all, it feels like the Bugs 3 Mini will be among the hottest drones in early 2018. It already has a plethora of great reviews so positive feedback is guaranteed. So, if you ask me – MJX Bugs 3 Mini is definitely a must-have! JJRC H12C – A Low-Cost Drone with a 5MP camera!